For months now I have been admiring photographs on Pinterest and Instagram of Hoop Art. The use of an embroidery hoop (wooden or plastic) to create and display a piece of fabric that has an embroidery or fabric design created on it. This is then displayed within the embroidery hoop, and hung as art. My skills when it comes to embroidery are at the bottom of the skill scale, so I decided to use fabric to create my own simple but effective Easter themed hoop art. I used some fabric from my scrap pile. Calico for the background and a pink polka dot for the bunny. I download the bunny template from the internet, but you could use any design. Once cut out used a little fabric spray adhesive, this temporarily stops the bunny hopping around on the fabric. I sewed around the edge of the bunny with a glitter pink thread. Placed inside the embroidery hoop, before trimming the fabric. I hand sewed around the edge of the fabric using a large running stitch, and gently pulled the thread in order to gather the fabric at the back of the hoop. Added a little decorative ribbon to hang my hoop from. 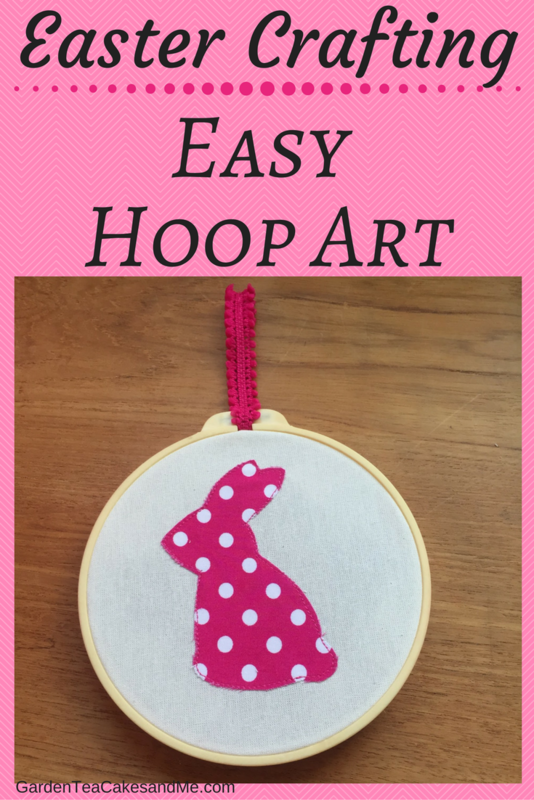 The pink bunny hoop art is now displayed in my craft room, which the pink bunny co-ordinates with perfectly. It looks beautiful, perfect for Easter. Wow your hoop bunny came out so cute! This just perfect for Easter. Have a wonderful weekend and a Happy Easter!